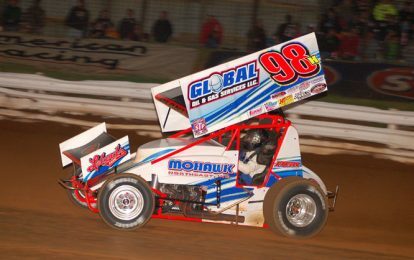 HARTFORD, Ohio – official release — Rick Rarer photo — Former World of Outlaws champion Dave Blaney held off his brother Dale Blaney to win the 410 sprint-car portion of Wednesday’s Lou Blaney Memorial at Sharon Speedway. The elder son of the late Lou Blaney took charge on lap six from Caleb Helms and set a torrid pace in the 30-lap sprint-car feature to beat his brother Dale at the finish for the $5,000 victory – his first in six tries in the Memorial event. From the outside pole, Helms took charge of the event from Caleb Griffith with Dave Blaney in third on the opening lap. Dale Blaney started sixth and was fifth after one lap then passed Cole Duncan for fourth on lap three. Helms caught lapped traffic on lap five while Dave Blaney began to challenge Griffith for second. Dave made the pass with an inside move in turn four on lap five then quickly caught leader Helms and made the winning move racing off the bottom of turn four one lap later. Griffith began to challenge Helms for second on lap seven and finally worked his way by two laps later in traffic with the help of the lapped car of Dennis Wagner. Dale Blaney meanwhile continued his way forward as he caught Helms and made the pass on lap 11 to grab third. Dale looked strong as he ran down Griffith and appeared ready to make the pass when the first caution was displayed for C.J. Jones with 15 laps scored. The caution erased a 4.208 second lead by Dave Blaney. Back under green, Dale Blaney put a slider on Griffith in turn two to steal the runner-up spot. A caution for a slowing Jason Dolick brought action to a halt with 18 laps recorded. Fast qualifier Lee Jacobs was quiet for most of the first half of the event, but worked his way back into the top five on lap 20 taking the spot from Duncan. Three laps later, the two-time Lernerville Speedway winner this season passed Helms for fourth. Dave Blaney was back in lapped traffic on lap 23 before the final caution was displayed for the fifth place running Helms, who was unable to make it off the speedway. When racing resumed for the final time, Rod George made his way into the top five passing Duncan for the spot, but that would be the final passing in the top five. Dave Blaney would go pretty much unchallenged by his brother in the final three laps to win by a margin of 1.286 seconds. The victory was Blaney’s third overall of the season in his Mohawk Northeast/Global Oil & Gas Services/Tom’s Sewer & Septic Service/Lelands.com/Bill Davis Trucking-sponsored No. 98H and the 28th of his career at Sharon in sprint cars to go along with two big-block modified wins. Dale Blaney, the current UNOH All Star Circuit of Champions point leader, was runner-up in an identical No. 98 car to his brother Dave. Griffith edged out a hard charging and fast closing Jacobs for third. George was fifth in Jim Chappel’s No. 8. Rex King Jr. drew the outside pole starting spot for the 35-lap BRP Tour Big-Block Modified feature and got a much needed caution just as it appeared Dave Murdick was about to take the lead. King then held off Murdick in the closing laps for his fifth win at Sharon this season and eighth overall on the circuit.